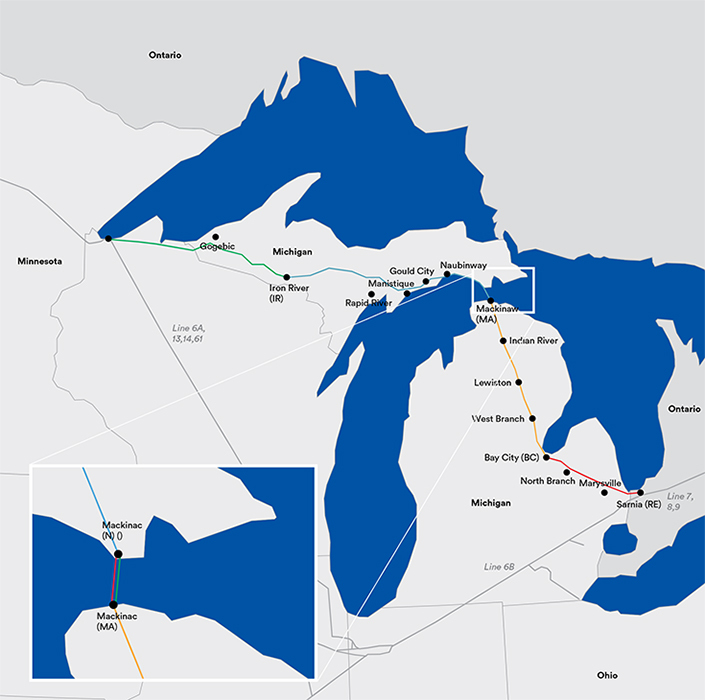 Line 5 is part of Enbridge's extensive Mainline network, carrying 540,000 bbl/day of light crude, synthetic crude and NGLs from a terminal in Superior, Wisconsin, through the state of Michigan, and into Sarnia, Ontario. The 65-year old pipeline runs under the Straits of Mackinac, which connects Lake Michigan and Lake Huron. Last spring, a tugboat allegedly dragged its anchor through the shipping channel, rupturing a pair of power cables and releasing 600 gallons of mineral oil insulation fluid. The adjacent Line 5 was damaged in the incident, although none of its contents were spilled. The line was temporarily shutdown during the investigation, which revealed several other small dents, also thought to be caused by ship anchor strikes. Enbridge agreed to replace the underwater segment and looked at several alternatives for the water crossing. Former Republican Governor Rick Snyder struck a deal with Enbridge to build a concrete tunnel, which would encase the pipeline. The tunnel could cost as much as US$500 million and take 10 years to build, but reduces the chances of an underwater spill to "near zero." Gov. Whitmer now promises to challenge Enbridge's easement in the state, due to concerns of potential impacts to water quality in the event of a spill. She opposes the concrete tunnel option and all deals stuck with the former Republican administration. The new governor says she supports shutting down the line completely, calling Line 5 a pipeline owned by a "foreign company" that moves their product through the state and puts Michigan's drinking water at risk. The line supplies Michigan with more than half of its propane demand, used primarily for winter heating. Michigan's Bridge Authority is currently conducting reviews on the replacement plans, with a decision expected in December. In the meantime, Whitmer is vowing to the take the case to court.